Don''t miss the television or online coverage of the 12th and final round of the 2017 Lucas Oil Pro Motocross Championship, the Christi Hubler Chevrolet Ironman National. Get the rundown below on how to watch qualifiers and all four motos on Saturday, August 26th. If you miss a race, full replays will be available on-demand with the NBC Sports Gold Pro Motocross Pass. New this year, the entire season streams live, on-demand and commercial-free with the NBC Sports Gold Pro Motocross Pass. Access the stream at ProMotocross.com and NBC Sports Gold app available on iOS, Android, Amazon Fire, Apple TV and Chromecast. 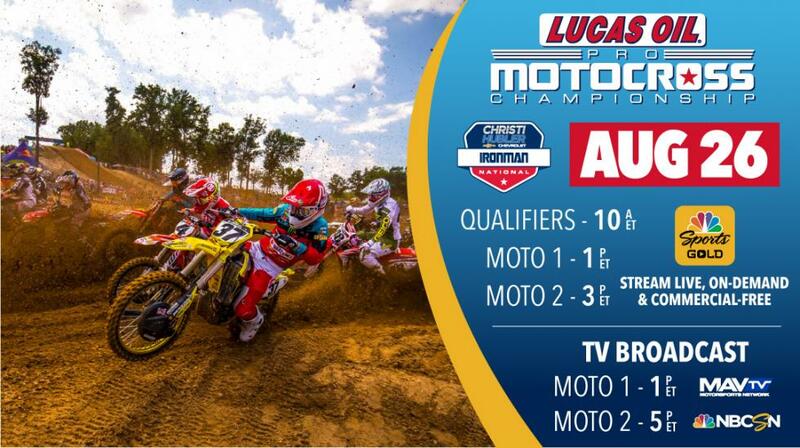 Once again this year, MAVTV will air first motos from all 12 rounds live. Use the MAVTV channel finder to see if you currently get MAVTV. You can also use that link to request that your cable provider carry MAVTV if they currently do not. NBCSN will have coverage of the second motos in both classes this week. Use the NBCSN channel finder to see if you currently get NBCSN in your area. NBCSN will have a one-hour show the week after each race recapping the action. New this year, the entire season streams live, on-demand and commercial-free with the NBC Sports Gold Pro Motocross Pass, available in Canada, UK, Germany, Sweden, Ireland, Denmark, Switzerland, Netherlands, Austria, Spain, Italy, Luxembourg and Japan. Access the stream at ProMotocross.com and NBC Sports Gold app available on iOS and Android in Canada, UK, Germany, Sweden, Ireland, Denmark, Switzerland, Netherlands, Austria, Spain, Italy, Luxembourg and Japan. TV: The Nationals will be simulcast to various countries across the globe. Check the TV listings for for the time in your area. TV: A one-hour highlight show recapping the race will air in various countries across the globe. Check the TV listings for the time in your area.